What will come in my bag? We create our menus weekly, based on what is at its peak seasonally. You will receive one meal kit, one-ready-to-eat meal and one farm-to-freezer meal that you can eat right away or stash in the freezer for another day. Usually, one of these 3 dishes is meatless. You will receive an email Friday night with the following week’s menu. Sign-ups are accepted on a rolling basis, if you subscribe before midnight on Monday night your delicious, farm-fresh meals will be available starting the following Monday. Each subscription is set on a 4-week renewal cycle. Your 4-week cycle starts the first Monday and renews every 4 weeks from the day you first signed up. Yes (some of them)! Pasture and Plenty provides a weekly meal kit option for Omnivore or Vegetarian meals. The Omnivore meal plan often includes one vegetarian meal during a week. To accommodate protein-based dietary restrictions, such as shellfish, lamb or pork, we would serve the Vegetarian option to you in place of the planned omnivore dish which includes the restricted item. We can accommodate mushroom and nut-free or other main ingredient substitutions, by swapping in a meal from our Farm-to-Freezer case, of the chef's choice, in place of the meal which includes the ingredient you stay away from. We ask for these preferences when you sign up, to assure the best service. We cannot accommodate dairy-free, cellulose-free, soy-free or gluten-free diets at this time. Can I preview my meals ahead of time and switch for something different? Not yet. We are growing fast and hope to offer flexible menu options soon. For now, all of our meal plan subscribers will receive either an omnivore or vegetarian version of the same 3 meals each week. See sample menus from past weeks here. Can I suspend my meal plan if I’m going on vacation or need a week off? Lots of Spring Break and travel plans coming up! Many in the P&P community take weeks off and share their weekly kit with a friend or neighbor. What a nice way to appreciate someone for being on call for snow shoveling and feeding/walking the pup:) If you share the love, we just need to know if someone different is coming to pick-up, or if there is a different address for drop off. Can I add more servings to my meal plan if I need to feed visiting friends or family? Absolutely. Just send us an email if you need to change your portion size for the week and we will contact you about the change in your billing. What happens in winter? Do you still use local ingredients? You bet. During the harvest seasons, we are always carefully canning, storing, drying, and freezing so we can offer the best produce our region has to offer, all year round. What should I do if I’m not home during the delivery window? We will deliver a big bag of farm fresh goodness to your door between 3:00 and 6:00pm every Monday. If you won't be home, just place a LARGE, water-tight, cooler outside your door. When you finish your day, it will be waiting for you. Need to make special arrangements? Just let us know. How does the food stay cold? Your farm-to-freezer meal serves as an ice pack for your entire bag. However, it’s a good idea to leave a cooler out if you won’t be home when your meals are delivered. Right now we deliver to the near West side (about a 2-mile radius around our storefront at 2433 University Ave) and to other portions of Madison, Middleton and Fitchburg. We are also busy working on establishing several pick-up sites around town. If four households in your neighborhood sign up, we can create a neighborhood pickup site for you. Your $10 delivery fee (covers an entire month!) will be waived and your neighbors will receive the Local Delivery fee! Right now we have a pick up site at Table Wine on Atwood Ave. We also offer pick up from our storefront. What day and time is delivery? When and where do I pick up? We will deliver a big bag of farm fresh goodness to your door every Monday between 3:00 and 6:00pm. Unless you have selected a neighborhood pickup site, your bag will be ready and waiting for you every Monday at our storefront between 3:30 and 6:30 pm. The address is 2433 University Ave. There is a small parking lot behind our building on Highland Ave.
Is there a lot of packaging and waste? Nope. We are very proud to offer almost zero waste. The meals will come in a canvas tote filled with reusable / returnable glass dishes. The farm-to-freezer meal serves as an ice pack for the entire bag. Keeping unnecessary items out of the landfills is extremely important to us and something that sets up apart from national meal kit services. What do I do with my Pyrex dishes? When you’re finished with your meals, just rinse out the pyrex containers, pop the lids back on, and put them back in the bag. Putting the lids on will keep the pyrex from clanking around and chipping. If you get your meals delivered, just leave the bag outside on your next delivery day and we’ll pick it up. If you pick-up, bring your bag back to us. Either way, it will be replaced with of fresh bag of farm-fresh goodness. What is the benefit to using a local service? You get farm fresh meals made right here, and know you are having a positive impact on the local food economy. 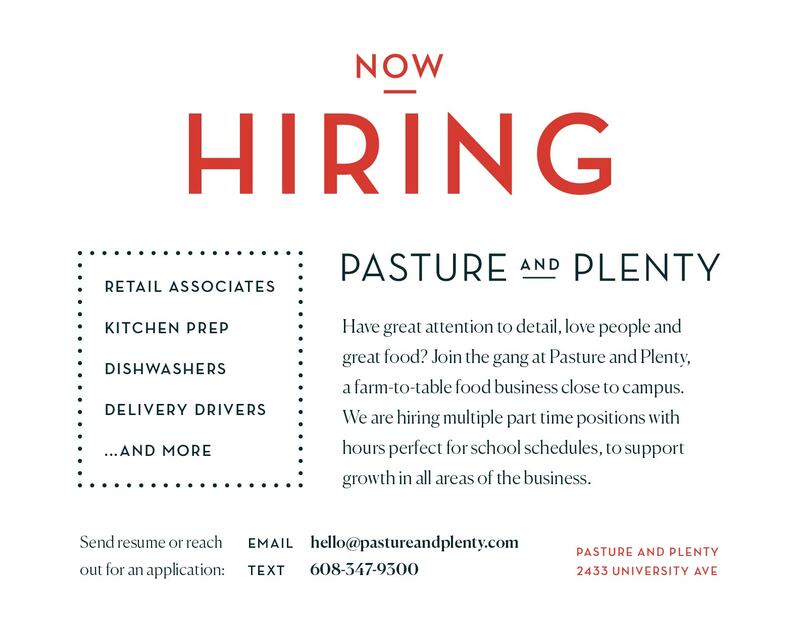 All the food dollars you spend at Pasture and Plenty go back to work here in our local community. We support our local farms and ranchers, hire local hands to do the work, and cut down significantly on the amount of waste used in packaging and emissions from shipping. How do I cancel or put a hold on my subscription? Do you accommodate food allergies/restrictions?